Phase Two of The Final Rule goes into effect in seven short months (November 2017), and the post-acute care community must invest time, energy and resources NOW in order to be prepared for the many changes brought on by this recent CMS mandate. There is an opportunity to leverage a competitive advantage by making early, aggressive decisions and/or changes to optimize marketability, partnership opportunities, etc. For example: Some SNFs may take advantage of an option suggested by CMS to complete the Comprehensive Care Plan within 48 hours (instead of completing the Baseline Care Plan and the Comprehensive Care Plan). While definitely a challenge, the ability to exercise this option will ultimately streamline efficiencies and demonstrate to patients and referral sources alike that a sophisticated, integrated approach to providing interdisciplinary care is in place. Is there a high volume of post-acute care patients? How aggressively are network partners reviewing performance metrics (ALOS, rehsopitalizaton rates, episodic costs, etc.)? Will there be a competitive advantage to aggressively tackling a 48 hour Comprehensive Care Planning process? If so, how will this be communicated/marketed to referral sources? Who will coordinate these redesign processes? Is there a competent staff in place, or should you look to outside consultants to help manage the processes/strategy? There is significant value in proactively collaborating with upstream/downstream partners. For example: Good communication between SNFs and their referring acute care providers will make it easier to accomplish early care planning goals. For example: does the SNF need more information from acute care (e.g. : Nurse to nurse? Rehab to rehab?) in order to effectively comply with these new processes? Collaboration between SNF and downstream providers like home health and outpatient services providers will ensure safe transitions to the next level of care. It is imperative to establish on-going communication with those servicing the discharge destination of your residents. A warm handoff will improve the likelihood of a successful transition and mitigate the risks of rehospitalization. Likewise, effective transition planning involving the resident/resident representative will become the hallmark of enhancing patient satisfaction scores. Those facilities able to integrate smooth transitional processes will enjoy high ratings from the community of caregivers/family/residents. Savvy home health providers proactively provide SNFs with metrics to support exceptional care (5-Star ratings, quality metrics, client satisfaction, etc.) to demonstrate their ability to care for residents discharged to their communities. SNFs will ultimately choose to collaborate with only the highest quality downstream providers, so home health agencies must step up to the plate to earn the business. Who will be the key point person(s) who owns the process of managing through the necessary care redesign initiatives? Who will be responsible for understanding and operationalizing these changes? Who will gather the information from the interdisciplinary team? How will this information documented? These boots-on-the-ground decisions will be critical to the success of implementing your strategy. Most importantly, all operators must start by understanding the elements of The Final Rule. Please see below for important details related to Phase 2. Before the Final Rule: A Comprehensive Care Plan was to be completed within 7 days after the comprehensive assessment, and discharge planning was not a requirement. In the New World: In addition to the Comprehensive Care Plan to be completed within 7 days after the comprehensive assessment, SNF operators must also develop – within 48 hours – a resident-focused Baseline Care Plan for all admissions. Note: Facilities will likely need to redesign admissions processes to accommodate for weekends and holidays to meet this requirement. As dictated by Phase 1, discharge planning must now be a part of the Comprehensive Care Plan. Residents/resident representatives are to be active participants in the care planning process. Also the caregiver’s support, capability and capacity to provide care upon discharge must be considered and documented. Residents/Resident representatives must contribute to setting goals, desired outcomes and discharge preferences (e.g. : plans for downstream services, goals, equipment needs). When discharge is not feasible, documentation must exist that specifies who made the decision and why. Initial goals, as well as any orders, must be included from MD, therapy, social services, dietary and PASSAR if necessary. Input from certified nursing assistants and food/nutrition services is also required. Review and sign-off from the resident/resident representative on updates to the Comprehensive Care Plan and on any outcome data to support choices when planning transitions of care. Take advantage of the perspective of outside subject-matter-experts who can help you decide what new processes/policies are necessary to enhance efficiencies, patient services and, clinical outcomes. 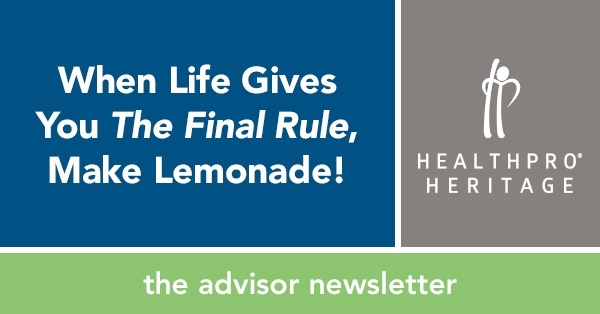 Contact HealthPRO®/Heritage today to help refine your strategy and execute on these important changes that will ultimately make or break your success in tackling The Final Rule requisites.